nb AmyJo: The doors blew us away, not us blowing the doors off. The doors blew us away, not us blowing the doors off. An odd title I know but I could not resist the reference to a well known Italian job phrase "You're only supposed to blow the bloody doors off"
We are absolutely blown away with them, they are stunning and that is an understatement! 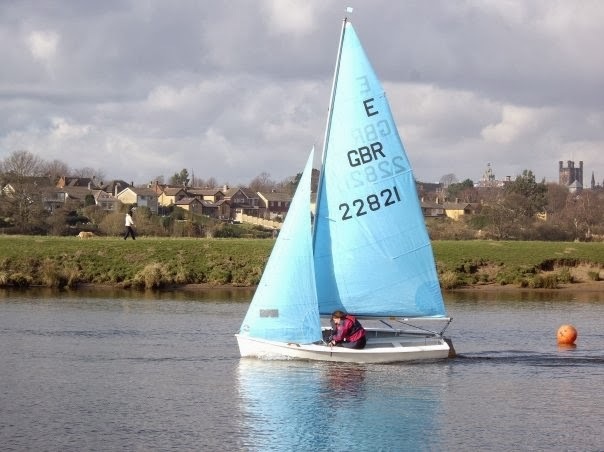 It is of us sailing "Heavens Ent" on a lovely summer's evening on the river Dee just upstream of the weir last year. That's Chris you can see in the photo and I am opposite her just out of sight. We asked him if he could reproduce it showing our dinghy in daylight on one panel and at sunset on the other. I have to say Andy has done just that and the result is truly amazing to say the least. I want to wait until we see the doors ourselves before posting a photo for you as Andy's text photo is not very clear when enlarged for the blog and won't do them the justice they deserve. With any luck we'll see them on our next visit on the 21st so will reveal them then. We can see now why Andy is in demand. He is an excellent painter and we really look forward to see what he will come up with on AmyJo's cabin sides for her name.